Before you perform a near-field analysis,you first need to know how the E and H fields are distributed. The five probes from the Probe Set R&S®HZ‑15 are well suited for this purpose. Before you perform a near-field analysis,you first need to know how the E and H fields are distributed. The five probes from the Probe Set R&S®HZ‑15 are well suited for this purpose. All near‑field probes are designed for ease of use, and are ideal for measuring high- frequency fields starting at 30 MHz on printed boards and on components. The magnetic field probes include special electrically shielded probe tips. 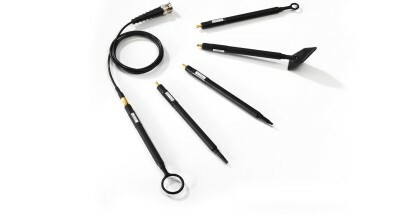 The various probe tip shapes are designed for tasks in near-field measurements. The upper limit frequency of a probe is determined by the size and design of the probe tip. 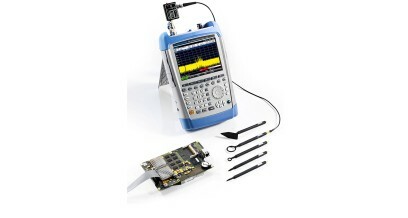 All probes are passive and are 50 Ohm input of a test receiver or spectrum analyzer. The Preamplifier R&S®HZ-16 increases sensitivity. Circuit designers usually perform nearfield measurements on a module to find out whether electromagnetic disturbance exceeds thresholds in line with EMC standards. Based on field strength measurements, the designer already knows several critical frequencies of the device or module under test. A practical way to reduce EMI is to analyze near fields, locate the sources and come up with targeted countermeasures.